Tear troughs are created by the hollowing of the under eye area that can result from the gradual loss of connective tissue and subcutaneous (under-skin) fatty tissue from the eye area. The result is a loss of facial volume and tissue elasticity — in the cheek area as well as under the eye — along with a mild reduction in bone volume and a general descent of skin. These not only combine to create tear troughs. They also accentuate dark circles under the eyes, making people look tired and worried, even when they’re well-rested and happy. The aim of treating the tear trough area is to rejuvenate the appearance and restore the volume back to its previous levels. This is achieved by optimally filling the tear trough area and making sure that there is no over-correction. The reas0n we want to avoid over-correction is mainly due to the fact that we want to achieve the most natural end result possible and not create bulging under eyes. 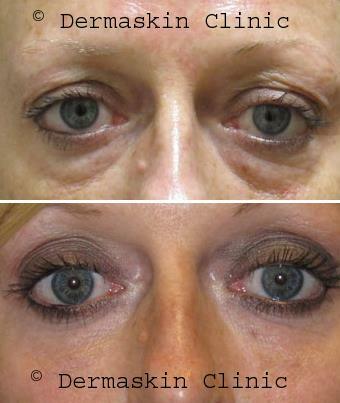 The filler will settle down within a few days and will feel soft and an integral part of the skin around the eye. Arnica is also very effective at reducing bruising and minimising and bruises in and around the eyes. Hyaluronic acid fillers last from 6 – 24 months around the eye region, depending on how each individual responds to the filler ingredients. Some people degrade the filler faster than others. There is usually some swelling after having a tear trough rejuvenation and it is advisable to relax and minimise strenuous activity in the 24 hours after having the treatment.